Above: Maida Vale Station. The fire places to warm the missing rooms are clearly visible on the end wall of the parade and on the front wall of the first and second floors can be seen the bonding ready for the extending brickwork.Below: looking eastwards along Elgin Avenue. The parades of shops facing each other are mirror images of each other except for the part that should be where the station is. Maida Vale in west London (just to the north of Paddington Station) takes its name from the Battle of Maida in southern Italy where the British defeated the French in 1806. Shortly afterwards the Hero of Maida Inn was opened in the Edgware Road and the surrounding neighborhood of Maida Hill and later Maida Vale spread out around it. In January 1915, an extension to the underground Baker Street and Waterloo Railway, universally known as the Bakerloo, was openned through Paddington to Kilburn Park. 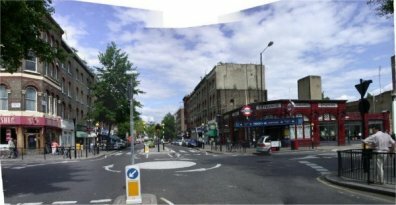 Prior to openning, calling the station after Elgin Avenue was considered, but Maida Vale Station, on the corner of Elgin Avenue and Randolph Avenue, was openned on 6 June of that year. It is clear that the coming of the underground railway was anticipated as the pair of parades of shops that face each other across Elgin Avenue and pre-date the station are mirror images of each other, except for the corner where the station is now built. Clearly the developer expected to one day complete his parade incorporating the station. Once again, it was not to be. The Bakerloo had very definite views on their stations, most of them being constructed in deep maroon glazed blocks and that is what was built. To this day the empty fireplaces of expected sitting rooms and bedrooms stare out over another broken dream.